In February of 2008, amid the looming global financial crisis, President Nicolas Sarkozy of France asked Nobel Prize-winning economists Joseph Stiglitz and Amartya Sen, along with the distinguished French economist Jean Paul Fitoussi, to establish a commission of leading economists to study whether Gross Domestic Product (GDP)--the most widely used measure of economic activity--is a reliable indicator of economic and social progress. The Commission was given the further task of laying out an agenda for developing better measures. Mismeasuring Our Lives is the result of this major intellectual effort, one with pressing relevance for anyone engaged in assessing how and whether our economy is serving the needs of our society. The authors offer a sweeping assessment of the limits of GDP as a measurement of the well-being of societies--considering, for example, how GDP overlooks economic inequality (with the result that most people can be worse off even though average income is increasing); and does not factor environmental impacts into economic decisions. 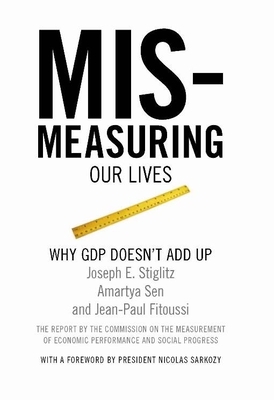 In place of GDP, Mismeasuring Our Lives introduces a bold new array of concepts, from sustainable measures of economic welfare, to measures of savings and wealth, to a "green GDP." At a time when policymakers worldwide are grappling with unprecedented global financial and environmental issues, here is an essential guide to measuring the things that matter.